Located at 7390 Rt. 14, Sodus Point, NY East side of road on the old cement coal trestle slab. As early as the 1850s, local Sodus Point businessmen realizing the advantage of Sodus Bay as a commercial port, proposed construction of a dock for exporting and importing goods. In 1852, recognizing the increased demand for coal, the Sodus Point and Southern Railroad Company was organized and construction was begun on a railroad line that would connect the coal fields of central Pennsylvania with Sodus Point by way of a section of the Pennsylvania Railroad. 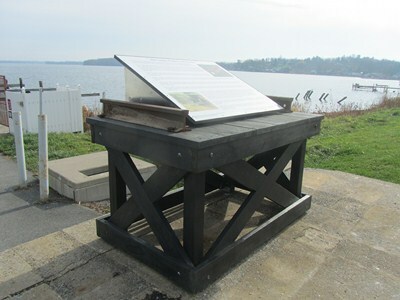 It was not until 1873, however, that the Sodus Point and Southern Railroad line was completed with its terminus at the west end of Sodus Bay at this site. This connected Sodus Point with the coal fields of central Pennsylvania. Here , a small, heavily constructed dock was built that was 400 feet long and stood 40 feet above the water. It had two sets of rails on top that ran to its outer end with two coal pockets under each set of rails. Coal pockets were structures into which the coal was dumped from the cars. Manually operated coal chutes would carry the falling coal to the boats hold. When a boat arrived, a coal car was placed over the top of a pocket and the doors at the bottom of the car were opened to permit the coal to drop into the pocket and run down the chute into the boat’s cargo space. In 1884, the Pennsylvania Railroad acquired the Sodus Point and Southern Railroad Company, which was experiencing financial difficulties. When the dock first started operations coal was shipped only to Canadian ports. By the turn of the century, coal was being shipped to American ports as well. Between 1892 and 1927, well over three million tons of coal were loaded. In 1927, because of an ever increasing demand for coal, the dock was completely rebuilt with heavy yellow pine timbers and was extended to 800 feet in length and 60 feet in height, with eight pockets and chutes. In addition to the work on the new trestle, the company added a storage yard for up to 12,000 cars. Because the size and capacity of coal boats jumpted from 2,500 tons in the 1870s to 13,000 tons in the 1960s, it was necessary to maintain a dredged channel 21 feet deep and 150 feet wide from the present day pier to the trestle, as well as a 700 foot turning basin at the loading area. In the early 1950s “shakers” were added to the trestle. Those fitted over the tops of the cars and shook them until all the coal dropped into the pockets. Prior to that, men had to climb into the cars with shovels and loosen the coal by hand. Yearly tonnage shipments increased from 32,174 in 1872 to 2,401,676 tons in 1956. 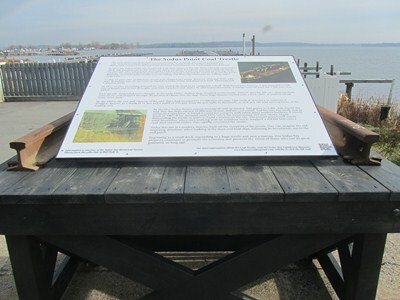 However, in the mid 1960s when boats were being built that could carry 25,000 to 28,000 tons of coal, the Sodus Point coal trestle, with its antiquated coal dumping operation and small coal storage area, found it could not compete with other more modern facilities and the operation closed in 1967. After the trestle had lain dormant for nearly three years, a businessman purchased the property with the idea of dismantling the trestle and using the lower section as a marina with 125 slips for pleasure boats. The dismantling project progressed well for over three weeks. Then, on a windy day in November 1971, while men were working with an acetylene torch near the outer end of the trestle, a bolt that had become red hot dropped onto a dust covered timber below. The result was a fire that virtually destroyed the trestle. Demolition work continued, however, and today the site is the location of a large and modern marina. Beginning as a small coal dock, expanding to a large coal trestle and finally a marina, the Sodus Point coal trestle property continues to aid the economy of Sodus Point. The spirit and technology of the people who envisioned the bay as an active commercial port have been preserved. Photos from the collection of Bill Huff, Jr.